Age of Ocean vs Other OSGs: Fight! I suggested Goemon check out Age of Ocean so he could write us another music article. While he’s writing that one he was kind enough to give us his own thoughts on the game. Consider it a second opinion. Also, if you can’t wait for Goemon’s next musical selection, Randomgeek just posted his own musical tastes to accompany Travian. Age of Ocean vs. Other OSGs: Fight! This isn’t actually intended to be a fight. It’s more like two mothers bragging to each other about their respective child’s accomplishments. There might not be a clear winner, and both kids clearly have their positive points and negative points. Alright that’s a pretty terrible simile as well. Let’s go back to the fight analogy. Age of Ocean is in kind of an awkward place when it comes to time devotion. I know Oliver touched on this in his review, but I think it’s an important point so I wanted to bring it up. Age of Ocean falls somewhere in between OSGs and traditional RTS games. Essentially, the build system is different than that of, say, Lord of Ultima for example. In LoU, the point is to cue up all the buildings you want built or upgraded, and depending how far along in the game you are, come back hours later to check the progress and maybe add some more to the cue. 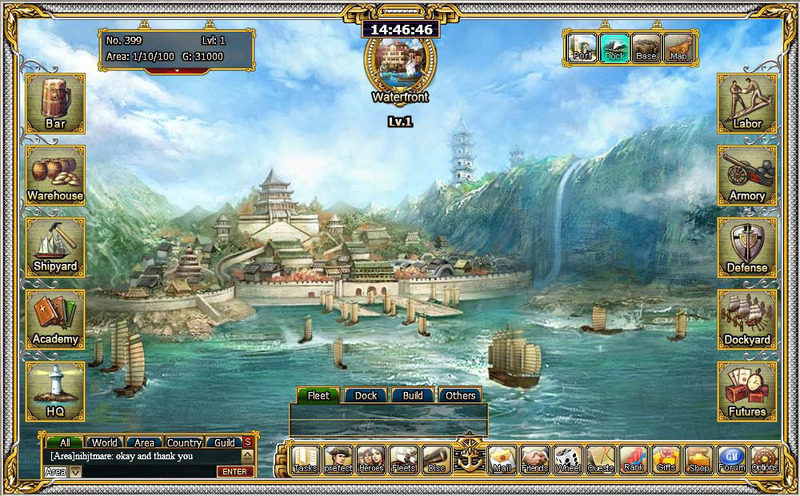 Even in the early game of AoO, buildings and technology take around 10-30 minutes to complete. This requires you to keep checking back on the game constantly, rather than just a few times a day. Obviously, this will be a blessing for some and a curse for others. At first, for me, I liked Age of Ocean’s approach, but it grew kind of tedious and I now I think I prefer the “set it and forget it”(oh yes, I went there) method. Age of Ocean has beautiful visuals. Beautiful, non-moving visuals. This is a bit of a double edged sword; with this comes no building placement customization. Your buildings don’t even have spots on a map, in fact. Instead, they are relegated to two bars on either side of the screen. On the positive side, though, every dock and screen has a different, attractive, background to check out. I’ll continue my comparison to Lord of Ultima, since that happens to be the other game I am playing the most at the moment, and is a pretty good representative of the OSG genre. In it, there are nice little building animations, smoking chimneys, rippling water, and the like. In addition, since the background is not static, you get to choose where to place your buildings. This element of customization really makes it feel like your town, as opposed to just a game interface. I think for this reason, even though the static backgrounds in AoO might be more attractive, LoU gets the edge. The standard OSG usually sets the player up with a couple of choices in regards to how they want to play the game. In general, the goal is to expand your empire. You can either do that by harvesting resources and building up an army to protect yourself, or you can harvest resources, build an army, and conquer your neighbors. Age of Ocean takes a slightly different approach. Yes, you still have your town (known as a Dock in game). But instead of harvesting crops and mining, well, mines, you focus on teching up and trading goods to make money. In addition, you get the nice bonus of exploration. And although the game has such a simple interface, I really did feel like I was exploring every time I set sail and showed up at a new harbor. And of course you can still build an army of ships to lay waste to nearby docks, like any self-respecting OSG would allow. So who wins this round? Once again, it comes back to personal preference, or in this case, personal play style. Normally, I enjoy sitting back and counting my money. But I like commanding a fleet and exploring the European coast. Maybe it’s just the novelty of something new in an OSG, and maybe that novelty will wear off, but for now I have to give it to Age of Ocean. Well, it looks like Lord of Ultima and the other standard OSGs won this battle. Does that mean you should just keep playing Travian and not give Age of Ocean a try? No way! It’s still a fun game that mixes in some new elements to the genre and I think everyone should give it a shot. 2 Responses to Age of Ocean vs Other OSGs: Fight! Thanks Oliver. I’m pretty pumped that I got referenced on another blog. If you keep posting them, I’ll keep writing them!